The massive oil spill in the Gulf of Mexico, which began with the Deepwater Horizon rig explosion on April 20 and continued to gush for another three months, posed a daunting set of challenges for the news media. Unlike most catastrophes, which tend to break quickly and subside almost as fast, the spill was a slow-motion disaster that demanded constant vigilance and sustained reporting. The story was also complex, dominated by three continuing and sometimes competing story lines from three different locales—the role of the London-based oil company, the efforts of the Obama Administration, and the events in the Gulf region—that taxed reportorial resources and journalistic attention spans. Coverage of the disaster also required a significant amount of technical and scientific expertise. News consumers were introduced to a series of new terms and concepts as the media tried to explain the efforts to contain the spill and formulate reliable estimates of the extent of the environmental and economic damage. The news media, in short, found themselves with a complicated, technical and long-running disaster saga that did not break down along predictable political and ideological lines. And they were reporting to an American public that displayed a ravenous appetite for the spill story. How did the press handle the challenge? 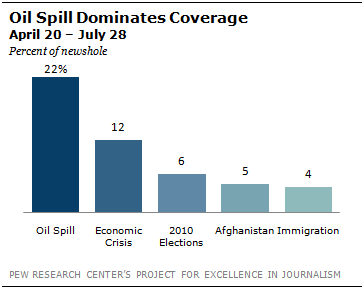 A new study of media coverage of the oil spill disaster by the Pew Research Center’s Project for Excellence in Journalism finds that, given the tough task they faced, the media as a whole seemed to rise to the occasion. News organizations displayed real staying power as events continued to unfold. They spent considerable time reporting from the Gulf and humanizing the crisis. They largely avoided the temptation to turn the disaster into a full-blown political finger-pointing story. And in many cases they used their websites’ interactive features to illuminate aspects of the story that would have been harder to digest in print or broadcast formats. In short, a news industry coping with depleted staffing, decreasing revenues and shrinking ambition was tested by the oil spill and seemed to pass. To evaluate that coverage, PEJ studied approximately 2,866 stories about the oil spill produced from April 20 to July 28—from the day that the Deepwater Horizon oil rig exploded to the day after BP CEO Tony Hayward’s departure was announced. The oil spill was by far the dominant story in the mainstream news media in the 100-day period after the explosion, accounting for 22% of the newshole—almost double the next biggest story. In the 14 full weeks included in this study, the disaster finished among the top three weekly stories 14 times. And it registered as the No. 1 story in nine of those weeks. The activities in the Gulf—the cleanup and containment efforts as well as the impact of the disaster—represented the leading storyline of the disaster, accounting for 47% of the overall coverage. Next came attention to the role of BP (27% of the coverage). The third-biggest storyline was Washington based—the response and actions of the Obama Administration (17%). The Obama White House generated decidedly mixed media coverage for its role in the spill saga, but questions about its role diminished over time—in part thanks to a Republican misfire. And the administration fared considerably better than BP and its CEO Tony Hayward, who on balance were portrayed as the villains of the story. BP emerged as the antagonist in the media narrative about the oil spill, particularly its CEO Tony Hayward. But outside of two Louisiana politicians playing smaller roles, none of the top newsmakers were portrayed as protagonists in the saga. The Gulf saga was first and foremost a television story. It generated the most coverage in cable news (31% of the airtime studied), with CNN devoting considerably more attention (42% of its airtime) than cable rivals MSNBC and Fox News. The spill also accounted for 29% of the coverage on network news as the three big commercial broadcast networks—ABC, CBS and NBC—spent virtually the same amount of time on the story. The spill story generated considerably less attention in social media, on blogs, Twitter and You Tube. Among blogs, for example, it made the roster of top stories five times in 14 weeks. But during those weeks one theme resonated—skepticism toward almost all the principals in the story. While some did better than others, many traditional media outlets made effective use of interactive features on their websites to track key aspects of the disaster. The PBS NewsHour’s Oil Leak Widget, for example, monitored the amount of oil spilling into the Gulf. The New York Times site offered a video animation that helped explain how a last ditch effort to prevent the spill failed. If anything, public interest in the Gulf saga may have even exceeded the level of mainstream media coverage. According to surveys by the Pew Research Center for the People & the Press, often between 50% and 60% of Americans said they were following the story “very closely” during these 100 days. That surpassed the level of public interest during the most critical moments of the health care reform debate.